French photographer Richard Unglik, tenderly recreates his passion for history, cinema and music with his favorite toy: Playmobil. A little humor, a lot of poetry and a generous hint of nostalgia defines the childlike poetry of Unglik’s art. creative photographer and artist, Richard Unglik, since 2000. 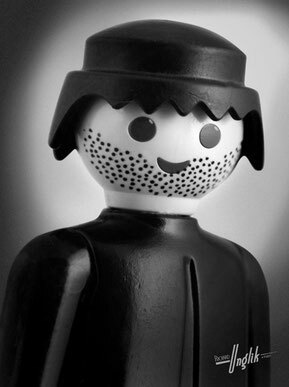 Unglik and Playmobil were both products of the 70’s and the resulting interaction was a natural and organic one for this photographer. Solely using Playmobils with their accessories and decors, he takes on the most well-known painters and sculptors, the most memorable movies, and the musicians who inspired his youth. Since his first show in Paris in 2011, Richard has participated in several exhibitions in France, England, Germany, Switzerland and now in the US. 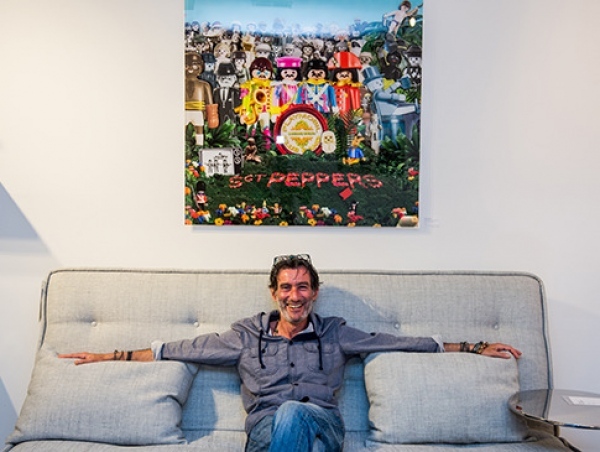 The artist, Richard Unglik, in front of the limited edition print of Sgt Pepper's in 39''x39''.